Walnut oil is an edible oil that is obtained from de-shelled walnut kernels by the cold pressing or solvent extraction method. Walnut oil has been in use in its native form for cooking purposes to add a distinctive flavor to preparations. In recent times, the use of walnut oil has been present predominantly in cosmetics and personal care products for its excellent results. Walnut oil also fits the natural profile for product formulations. As such, the demand for walnut oil for cosmetics has been on the constant rise from the cosmetics and personal care segments. In terms of volume, the conventional segment of walnut oil exhibits dominance over the other segments, consistently, which can be mainly attributed to its price and availability in different regions. The preference for an organic segment of walnut oil is also majorly observed in the walnut oil markets in developed regions over developing regions. This can be attributed to the spending capacity difference and the pricing of organic walnut oil. However, with increasing consumer spending capacity and the organic trend catching up, the organic segment is expected to exhibit robust growth over the forecast period. The growing demand for walnut oil in the cosmetics and personal care sector is fueled by the growing awareness amongst general consumers towards its multiple benefits. Owing to the rise in the Internet culture, the ease with which information is available for home-made remedies for skin conditions and personal care has improved. This has led to consumers opting for medicinally beneficial oils like walnut oil for home-made personal care products. The growth in the demand for the native form of walnut oil has mainly risen due to this very reason. 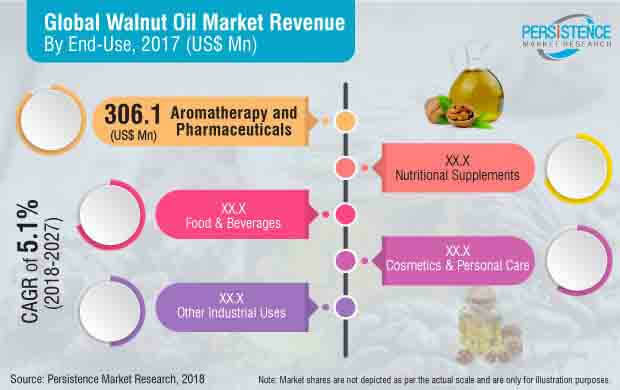 In terms of value, the global walnut oil market is expected to represent an incremental opportunity of US$ 601.1 Mn by 2027 end over 2018. By nature, the organic segment is expected to register a CAGR of 6.3% in the walnut oil market. The European region is expected to register relatively low growth in the walnut oil market, due to a matured market and an already strongly established trade pattern for walnut oil. APAC and North America hold the largest shares, owing to the production and consumption patterns from both the regions. An increase in GDP, globally, especially in developed countries, has resulted in walnut oil being viewed as a relatively affordable product with multiple health benefits, rather than an expensive product, thanks to the results that walnut oil provide. The increased awareness about the health benefits of walnut oil serves as one of the most influential drivers for the growth of the market over the forecast period. Owing to the increased demand, multiple cosmetic and personal care products manufacturers have incorporated walnut oil into their product formulations, resulting in business to business distribution being one of the most prominent modes of distribution for the walnut oil market. The use of walnut oil as a carrier oil has also been a supporting factor for the increase in its demand from the cosmetics and personal care industry. Walnut oil has long been described as a nutritionally rich source of omega-3, omega-9, and omega-6 fatty acids. This has certainly been a driving factor for the demand for walnut oil for nutritional supplements. The nutritional form of walnut oil is available as soft gel capsules of walnut oil, which have been experiencing an increased demand, owing to the increased vegetarian population that cannot consume animal-sourced fatty acid supplements. The processing cost of walnut oil has been one of the restraining actors for the walnut oil market. This results in the higher price of walnut oil in general, and consumers become more reluctant to make the purchase decision as compared to other edible oils. This can be witnessed more in regions with low dispensable income as compared to developed regions. On the basis of region, the market in North America is anticipated to dominate the global walnut oil market through 2027. Following North America, APAC is one of the most dominant markets for walnut oil, and this is majorly attributed to China being the largest producer of walnut oil, and APAC accounting for the significant demand for walnut oil in the global market. North America is expected to gain significant market share in revenue terms by 2027 end. Moreover, North America and Latin America are anticipated to exhibit significant CAGRs during the forecast period in the walnut oil market. MEA and APAC are in a significantly close call with North America and Latin America, owing to both being rapidly developing regions with a steadily growing consumer base armed with a higher spending capacity. Due to all these factors, it is expected that, the global walnut oil market is expected increase positively in terms of value and volume during forecast period.